Shock – the word was said countless times yesterday at the BASS Elite Series event at Lake Champlain. No one said it more than Aaron Martens. Entering the final day in 19th place, the veteran cracked 23-5 to pull off the surprise comeback victory. Making the win even more noteworthy is that had the first day of competition not been canceled due to high winds, Martens may have not gotten a chance to fish on Sunday. The victory was the ninth of his career, which puts him in rare company as an angler. 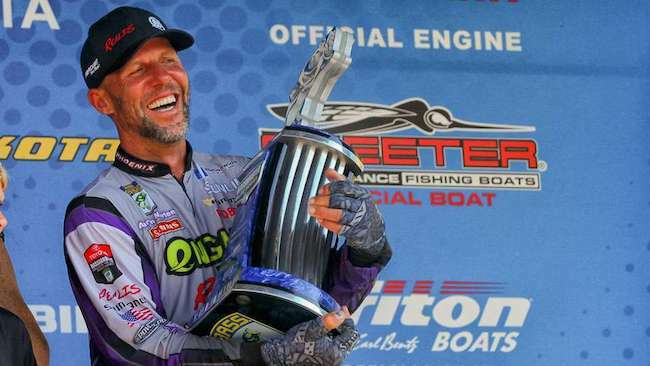 That said, Martens is often best known for his 13 second-place finishes, including four at the Bassmaster Classic. High finishes and consistency have been the theme for much of Martens’ career, as he’s been a staple in the top 10 of our rankings seemingly since we began, rising as high as No. 2. However, he’s had a couple bad tournaments the last two years, causing a slide outside the top 20. Yet, with this victory, he’s back up to 21st. He’s about to drop some good finishes in August, including his last victory at the Chesapeake in 2015, but he’ll also drop one of his worst finishes in September. So Martens could very well be back in the top 20 by season’s end. Meanwhile, Jacob Wheeler has separated himself from the rest of the sport. His fourth-place finish this past weekend bumped his two-year average to a staggering 874.666 – which means he’s AVERAGING 14th in every major event, or nearly averaging making the top 12 cut for two-straight years. The next closest angler is Bryan Thrift at 853.059, and then there is a massive drop to Andy Morgan at 825.929. To put that in perspective, the difference between Wheeler and the third-place Morgan is roughly the same as the difference between Morgan and James Elam in 16th. Not to be lost is the weekend’s runner-up, Brandon Palaniuk. He extended his Angler of the Year lead, and as we illustrated last week, he’s now made six top 20s in a row and sits in seventh in the rankings. Want an eye-popping stat? Take out his bomb at the second event of the season at Okeechobee, and Palaniuk’s average is 938.013. That Okeechobee event and the Bassmaster Classic are the only things stopping him from challenging or possibly surpassing Wheeler for the top spot.